Are you sick of climbing up a ladder to clean out the gunk in your gutters? 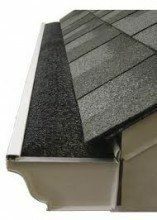 If so, allow the experts at Advantage Roofing & Home Exteriors to provide you with premium gutter guards for your house in the Cincinnati, Ohio, area. These products will allow your gutters to channel rainfall away from your home while preventing debris from entering the gutter system. No longer will twigs, pine needles, seed pods, leaves, or other plant matter fall into your gutters and create blockages. At Advantage Roofing & Home Exteriors, we provide our clients with both exceptional products and services. We will make certain your gutter guards are installed correctly and in a prompt manner. Our dedication to top-notch customer service and professional installations has earned us a number of accolades throughout the years, such as an A+ rating with the Better Business Bureau. If you want to get one step closer to never having to clean out the gutters on your Cincinnati, OH, home again, contact Advantage Roofing & Home Exteriors today. One of our friendly and knowledgeable associates will be happy to speak with you in detail about the outstanding products we sell and install, including seamless gutters and a variety of gutter guards.